PropEyes, a device designed for progressive lens wearers who work at a computer – Eyecare Center of Maryland – Dr. Norman Shedlo O.D. Chimborazo, a Bethesda, Md.-based startup, is introducing PropEyes, a device designed for progressive lens wearers who work at a computer. Features: The reading zone in progressive lenses is at the bottom of the lens. This results in users having to tilt their necks back awkwardly to properly view a computer monitor. PropEyes is a simple, small, lightweight, convenient and inexpensive eyeglass accessory designed to elevate the reading zone in a progressive, bringing the monitor into focus while working at a computer and reducing neck and back strain. 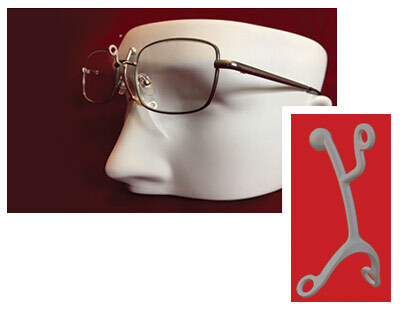 The device is designed to fit any type of eyeglass frame and any shape of bridge. Availability: PropEyes comes in hypo-allergenic plastic, bronze, stainless steel and sterling silver. The figurine versions come in bronze, brass and sterling silver.